Although you are emotionally secure with who you are, the Moon in the 2nd house tends to bring feelings of insecurity when it comes to obtaining material possessions. You appreciate beautiful things and want to have the best for your home. You struggle between being frugal and buying nice things for your home. Because you would rather practice logic than be emotional, you tend to be more practical when it comes to your spending habits. Validation from others is very important to you and your feelings of self-worth. You want people to see you as rational and trustworthy, and most of the time they do. What you worry about is how they will perceive you when you find something pretty or fancy that will look lovely in your home or office. But don’t worry – because you are such a practical person you will make that money back easily through your various ways of making and saving money. You generally make smart investments and you keep a close eye on your funds. Even with the Moon in the 2nd house, you rarely purchase something without knowing how much will be left in your accounts. Because you are so responsible with your dollars, it doesn’t take much to get yourself back up to where you want to be financially. But this is where the emotions of people with moon in second house tend to get the better of you, as you feel you are worth buying such an expensive piece of art. You work hard to take care of yourself and your family. So you rationalize that you deserve such a lovely and expensive gift. Just be careful about hiding your emotions from others on this front. 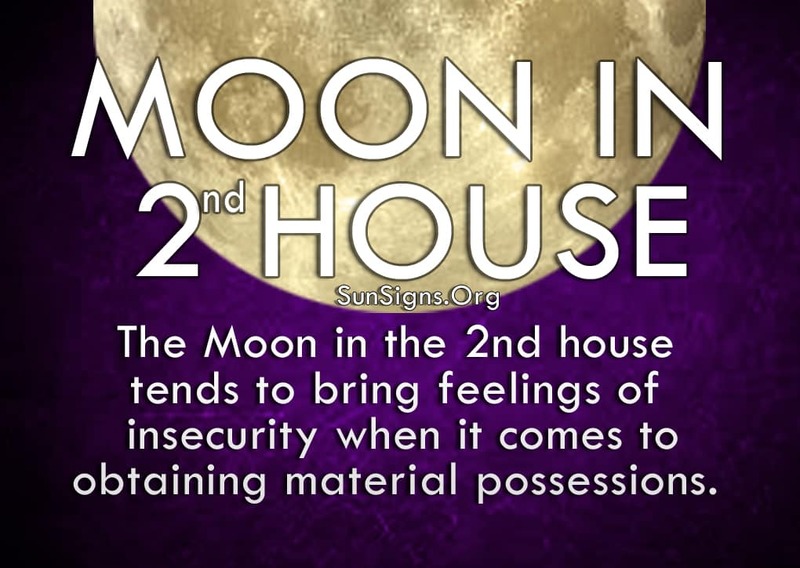 Moon in 2nd house astrology shows that you tend to be more sensitive toward your material possessions, so much so that you can be quite protective of them. While others simply show an interest in them, you tend to obsess over their value and why they are important to you. This is the only time you can become a bit too emotional, whereas the rest of the time you hold everything back until just the right moment. Don’t get too caught up invalidating your image, or else you may lose your true sense of self. Learn what’s most important to you and spend your emotional energy on that. The money issues will resolve themselves.